A Tribe Called Red, a Canadian electronic DJ collective made up of indigenous musicians with the core members of DJ NDN, Bear Witness, and Tim “2oolman” Hill, builds upon a movement in artistic and activism-based media that unifies a modern identity for Indigenous peoples with their most recent album titled “We Are the Halluci Nation.” The album premiered the 16th of September this year. 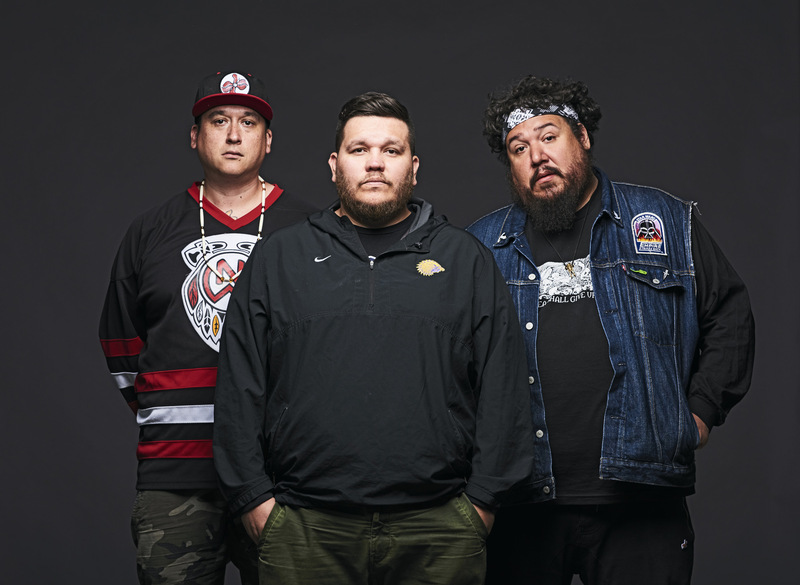 A Tribe Called Red’s global popularity has given them a large-scale platform for the performance of their music that is not only socially conscious, but is also socially active in redefining Indigenous identity. A collaborator and forefather for their artistic and social message is John Trudell (1946-2015), the former chairman of the American Indian Movement (AIM), poet, and musician. The first track on their album (also titled "We Are the Halluci Nation") featuring John Trudell’s poetic words is a forthright introduction to a side of Indigenous and Aboriginal identity that is often excluded from mainstream media's depiction of them. We are the tribe they cannot see. We live on an industrial reservation. The debut of their third album arrived on the scene at a crucial point in time for the social and political unrest about Indigenous rights and activism. With the protests at Standing Rock in North Dakota over the plans for the Dakota Access Pipeline, the global Indigenous community along with A Tribe Called Red have stood in solidarity with those at Standing Rock. The protests have included a collective representation of most of the Indigenous communities across North America to fight against the pipeline’s construction and its threat to water resources. Having been known for creating a communal and inclusive club scene in Ottawa through their Electric Pow Wow nights at the Babylon Nightclub, A Tribe Called Red’s growing global reach has prompted an inclusive community of collaborators on their most recent album. In addition to John Trudell, featured collaborators include the Iraqi-Canadian rapper Narcy, Yasiin Bey (Mos Def), Indigenous Australian group OKA, Inuit throat singer Tanya Tagaq, Swedish-Sami Indigenous singer Maxida Märak, and Columbian visual-artist and musician Lido Pimienta along with other writers, musicians, and artists. As a DJ collective, A Tribe Called Red has the artistic flexibility to integrate a diverse showcase of different sounds and voices into their music. Electronic music is a genre best experienced through the participation in the performance in the clubs and venues showcasing the musicians. The experience is constructed from those in the audience and the those who perform. A Tribe Called Red’s genre of music enables the dance floor to be transformed into a redefined “sacred space” for these cultural narratives to be passed on and performed, while simultaneously resonating deeply with fans of the EDM and hip hop genres. Collaborating with other Indigenous musicians in their work has allowed them to bring together an artistic community to front their new collective identity for Indigenous people. Their latest music video for their track “The Virus,” features Saul Williams and the Chippewa Travellers. The video unravels the story of the continued oppression on Indigenous rights in the modern age that is displayed through the clips of militarized violence and invasion aimed at ethnic groups all over the world. These scenes are juxtaposed by choreography of the faces and individuals participating in the Electric Pow Wow. “We Are the Halluci Nation” embodies a contemporary voice that transcends the boundaries of a singular geographic origin to create a unified identity for a global community of artists and activists working on their own terms to perform outside of the misrepresenting and dehumanizing effects of colonialism. With music that strays from the conventional and clichéd rhythmic compositions of the EDM (Electronic Dance Music) genre, “We Are the Halluci Nation” is an album vocal in its social activism and its cutting-edge sound in the EDM scene. "We Are the Halluci Nation" can be heard on ITunes and Spotify with selected tracks on Soundcloud. Lyndsey Walsh is a Biological Artist and NYU grad who studied the culture and representations of Indigenous communities in the Americas and Australia.